Tens of thousands of young people in U.S. communities big and small walked out of school to demand action on gun violence Wednesday in the biggest demonstration yet of the student activism that has emerged since the massacre in Parkland, Florida. At Marjory Stoneman Douglas High School — where 17 people were killed by a former student — students filed outside at 10 a.m. and gathered to honor the victims of the Feb. 14 massacre. After holding a moment of silence, speakers addressed fellow classmates and faculty members, and warned lawmakers to "keep in mind that many of us will vote this November and many more will flood the polls in 2020." The more than 3,000 walkouts were organized by Empower, the youth wing of the Women's March, which brought hundreds of thousands to Washington, D.C., last year. The group urged students to leave class at 10 a.m. local time for 17 minutes — one minute for each victim in the Florida shooting. Thousands of students in the Washington D.C., area gathered in front of the White House, holding colorful signs and cheering in support of gun control. The students chanted, "Hey, hey, ho, ho. The NRA has got to go!" President Donald Trump was in Los Angeles at the time. Among the students in D.C. was 16-year-old Jackson Monroe, of Bethesda, Maryland. He told NBC that 15-year-old kids should not be worried about getting shot at school and he hoped the protests spur lawmakers to pass sensible gun laws. "I trust someone with a sensible mind in government will do something about it. I trust someone does something. People are fed up," Monroe, a sophomore at Chevy Chase High School, said. 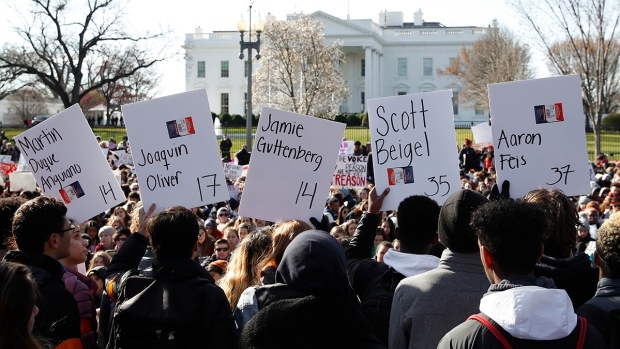 The students marched to the U.S. Capitol where they were joined by Democratic lawmakers in demanding gun control legislation. Democratic House Minority Leader Nancy Pelosi praised the students for commanding the attention of the nation by "bringing this fight to the doorstep of America." Matt Post, a senior from Montgomery County, Maryland, who spoke at the rally, lambasted lawmakers who value "blood money" from the National Rifle Association "over the lives of children," and called out the White House and Congress for having a "moral problem." "Their right to own an assault rifle does not outweigh our right to live," Post said. "The adults have failed us. This is in our hands now, and if any elected official gets in our way, we will vote them out." Students in cities including Chicago, San Diego, New York City, Los Angeles, Miami and across the Bay Area, from the elementary to college level, were taking up the call in a variety of ways. At some schools, students didn't go outside, but lined hallways or took a knee. Others gathered in gyms, auditoriums or on football fields and honored the victims by holding a moment of silence around 17 empty chairs. They also took their message to statehouses across the country, declaring enough is enough. Though the demonstrations were mostly peaceful, in Chicago, students from Kenwood High School reported seeing at least five classmates handcuffed, one of them detained, according to the Chicago Sun Times. A Chicago Police Department spokesman said the 16-year-old student was placed in custody after walking out into the traffic lanes of Lake Shore Drive, blocking a thoroughfare. It was not immediately clear if the student will face any charges. "In Florida, the governor is already changing laws. We know it can happen, we just have to keep pushing for it," student Grace Delvecchio told NBC Philadelphia. Students at Granada Hills High School in Los Angeles spell out "ENOUGH' in a call for action against gun violence. The walkout was during a day of mass protests at schools across the United States Wednesday March 14, 2018. 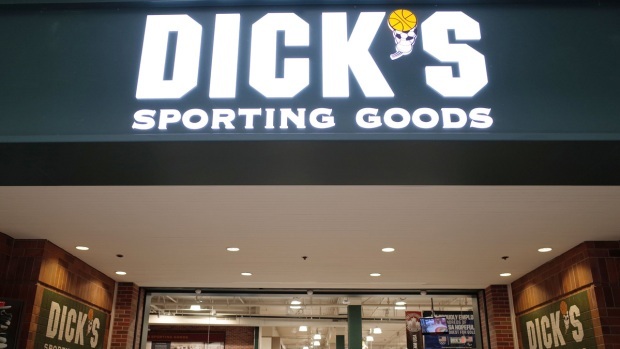 After the walkout Wednesday, some students in Massachusetts said they planned to rally outside the Springfield headquarters of Smith & Wesson to call on the firearms manufacturer to help curb gun violence. 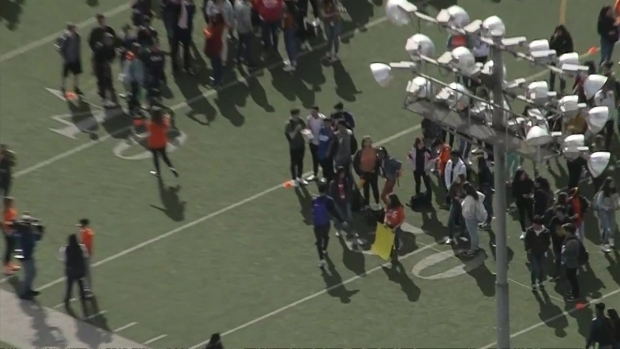 The walkouts have also drawn support from companies including media conglomerate Viacom, which suspended regularly scheduled programming on MTV, BET and all its other networks for 17 minutes during the walkouts. Students temporarily took over MTV's social media accounts. About 10 students left Ohio's West Liberty-Salem High School — which witnessed a shooting last year — despite a warning they could face detention or more serious discipline. Police in the Atlanta suburb of Marietta patrolled Kell High, where students were threatened with unspecified consequences if they participated in the walkout. Students in Sayreville, New Jersey, were also threatened with two days of suspension if they participated in the protest, NBC New York reported. Education Secretary Betsy DeVos had no immediate public comment on the walkout. Meanwhile, free speech advocates geared up for a battle. The American Civil Liberties Union issued advice for students who walked out, saying schools can't legally punish them more harshly because of the political nature of their message. In Pennsylvania, Wisconsin and Texas, some lawyers said they would provide free legal help to students who are punished. Associated Press writers Jeff Martin and Kantele Franko contributed to this report.